"Red Tails," the film inspired by the exploits of the Tuskegee Airmen from executive producer George Lucas, is plagued by a crippling amateurishness, beginning with the opening credits which look about as good as a subway ad for a vocational school, but most egregious is the wretched dubbing that leaves you wondering if you're maybe watching an Italian swords-and-sandals epic from the '60s. If you've somehow made this far in life without knowing, the Tuskegee Airmen were an all-black squadron in the United States Air Force during WW II, whose wartime service consisted mostly of non-combat missions, as their racist superiors remained unconvinced of their abilities. But they would ultimately be given a chance to take to the skies against German fighter pilots, proving themselves to be just as gifted and courageous as their white counterparts—this is their story. Unfortunately, "Red Tails" runs almost as long as a tour of duty, and, like the combat it recreates, involves long stretches of tedium. It's amazing that a collaboration between John Ridley, who penned the brilliant "Three Kings" and Aaron McGruder, creator of the razor-sharp comic strip "The Boondocks," couldn’t produce a better script. Apparently it wasn't sufficient to tell the inspirational story of a group of men who overcame prejudice. No, we're also subjected to a totally perfunctory (to say nothing of unbelievable) "romance," a "Hogan's Heroes" sidebar, and a half-dozen other hackneyed subplots. Hollywood's been making terribly unfocused war films about white people for decades, but it's not clear this is the sort of equality black America needs at the cineplex. And honestly, if they'd jut cut every scene of the romance, the film would've lost nothing and audiences would have an extra 30 minutes. "Red Tails" tries to develop so many characters that it ends up rendering most of them as 2-dimensional, with only David Oyelowo's Joe "Lightning" Little getting any sort of depth or arc. Cuba Gooding Jr., who's made a career of scenery chewing, takes the art to a new level. With little more than a pipe, a hat, a clenched jaw and a self-satisfied grin, Gooding somehow manages to distract from the action even when standing silent and motionless. It's a virtuoso display that caroms from silly to brilliant to self-mockery. 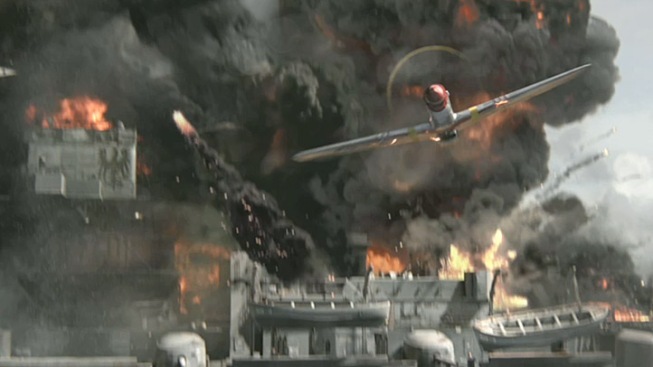 The film's lone saving grace is that air battles are awesome--when they're not being interrupted by bad dialog. Planes dart and dive, turning on a dime directly to come at you with a suddenness that renders 3D unnecessary. "Red Tails" director Anthony Hemingway has all the powers of George Lucas' magic factory at its command, and uses them well, but it's not enough to save the movie. The Tuskegee Airmen deserve a better film than "Red Tails," and so do you.